Greywolf has good track ir settings (like some kind of over filtering setting that the software will take but is not in the default range presented) The setting keeps the display from moving about once it is on an area of interest; kind of like pausing, only no keystroke is needed; It is in the filter settings. I have used >>only<< track ir to zoom in on a area of the cockpit with this filter and it is still enough to be useful, howbeit it does limit the head movement, but it works reasonably well, just not as still as pausing. Its all a matter of personal taste. You may already have this but If not and if you want to try that one out let me know. I Know what you mean Silver. I tried to use dual screen and got severely clobbered for it. I use pan view with the mouse to help with that. I use track IR but only for general scanning out the window while flying. I think I may be even more blind than you. The mouse pointer is visible but with track ir, there is a motion drift to the display, so zooming in for a click on a switch does not always work out nicely for me. I need time to focus on what I am seeing, a still display makes this possible. You probably do something like this below. I'm sure its not perfect but it is the best I can do. General Discussion / Re: Very interesting stuff happening in our armed services these days. For a free mod I think the aircraft is really nice. I still like it as a DCS beginner jet and its worth downloading and installing, (Ask Mo). DCS Series Flight Sims / Re: what is this? Deleting saved game, so simple.. Gees! Whew ! That was close! I'm installing again, this time for good. The problem as I see it now is 'lua' related so I will try rams suggestion above when it is finished installing. I suspect the lua approach could work, but probably will not take. My fear is that my erroneous configuration is somehow stored in a remote server, the way steam does it. If so, I will never be able to fix this without a support ticket. IS there anyone here that knows which if any registry items are affected by installation? What kind of format does these LUA files require? ANSI, unicode, utf8? yes the links that show actually work. DCS Series Flight Sims / what is this? After 3 attempts at un-installation and installation, each of which took many hours, I am still presented with this display when the game starts.. Please notice that I have no modules and more importantly, no access to any of the icons above, like settings, etc.. The game interface is squashed and many buttons are missing. Has anyone in DCS world seen anything like this? When uninstalling, every file left behind was deleted, including the game folders. NVIDIA control panel shows one display only ( as it should be) . I simply cannot figure out why this is happening to after completely uninstalling the game. It was ok on the first install then I went in and was looking for a way to make the display larger, stumbled across multi monitor and FOV selections somewhere, that is all I remember. Because the game was completely uninstalled, more than once how can this be? It seems DCS keeping some settings persistent on an off site place that I cannot access, thus I am screwed. and understandably, quite annoyed. 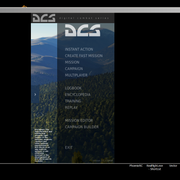 This DCS installer seems to me to be a little off the charts.